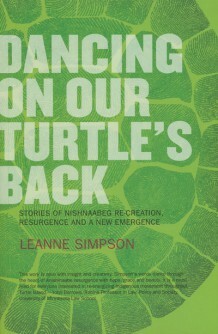 Dancing On Our Turtle’s Back writer Leanne Simpson, and publisher ARP, have agreed to give away 4 copies of Simpson’s great book (2 from Simpson and 2 from ARP). Answer all 3 questions below correctly and email me at blackcoffeepoet@gmail.com with Dancing On Our Turtle’s Back Contest Answers in the subject line. No cutting and pasting answers. The first person to get the answers right wins the Grand Prize. 1. In her review of Dancing On Our Turtle’s Back Zainab Amadahy credits Leanne Simpson with demonstrating three key components that “underlie” Nishnaabeg culture. What are the 3 components? 2. In her interview with Zainab Amadahy Leanne Simpson names what she believes to be the “base” of Indigenous resurgence. What is this “base”? 3. In her video reading for blackcoffeepoet.com what day and date is Simpson writing about? How long does Simpson say the procession lasts? And which Elder does Leanne Simpson quote? Contest Ends July 14, 2012!